Wheels of Time is an initiative devised by Ashford Museum and Kent Children’s University and is funded by South East Museum Development Programme and The Brett Group. It has been adopted by 25 museums and heritage centres across Kent and we are proud to have joined the initiative in 2017 as the first railway to be involved. Children aged 5 to 11 years are invited to join Roamin Rex (left) to learn more about each heritage site where you progress through an activity to collect a unique badge for the venue. On collecting ten badges you earn a special Roamin Rex Award Badge. Our exclusive badge features a Bagnall steam locomotive (see above right). If you are aiming to complete the Wheels of Time activity sheet during your visit, we recommend that you allow at least two hours for your visit. It may also be easier to complete the activity on a non-event day as there are other demands on your time, such as treasure hunts! 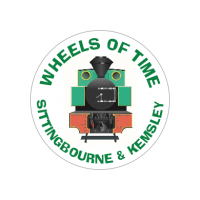 The Wheels of Time is free and at the Railway you can collect the activity sheets from the ticket office at Sittingbourne Viaduct station and hand them in for verification and to receive your badge at the shop at Kemsley Down. It is free to participate and you can keep up with the latest news about Wheels of Time through the newsletter, Facebook and Twitter. There are ten Wheels of Time sites in the borough of Swale, four in Sittingbourne, one in Milton Regis, four on the Isle of Sheppey and one in Faversham. So it is possible to attain your Roamin Rex Award Badge without leaving the Borough! Sittingbourne’s Steam Railway – that’s us!